Vada's Blog Stamp Inks and Paper : Faux Designer Paper from Dec 08. Faux Designer Paper from Dec 08. I’m back for today as Hubby is working in the Dells, so I have free time. 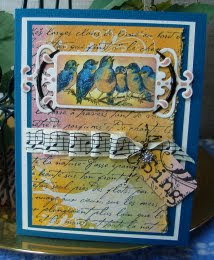 My card today is from Dec 08 Technique Junkie’s Newsletter. Alterations Die to use as a stamp. 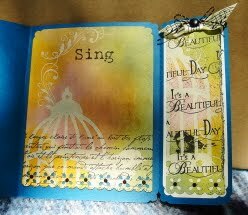 I used Tim’s new Distress Inks in colors of Spun Sugar, Wild Honey and Bundle Sage. I too love your use of fun foam to create stamps. They really tie the other images all together to create a wonderful card. I've always loved your work and am always inspired by your designs. Thank you for sharing your work! Brilliant!! Always creative & inspirational! I love the musical ribbon on this card, Vada! Absolutely stunning! I am adding your blog to my Reader so I don't miss anything ever again. This card is so incredible I can hardly find the words to describe it. Such a wonderful blend of color and elements, Vada. I LOVE LOVE LOVE it!! 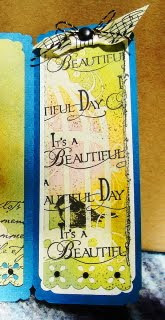 I just love the colors - and what a great idea to make fun foam stamps! I'm going to remember that one! Fun foam! What a great idea. These are just stunning! !